Want to squeeze the most out of Ramadan? 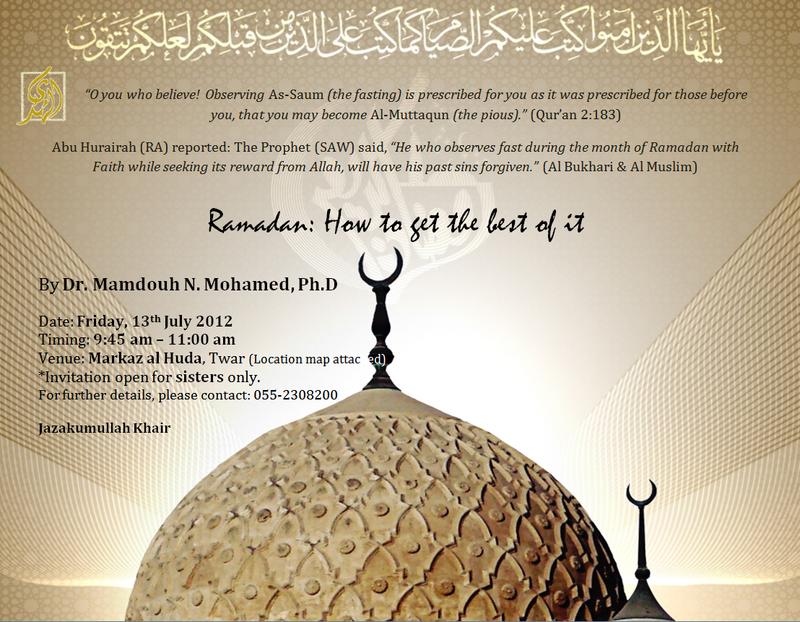 This 29-day course consists of two daily classes during Ramadhaan. The first class, Fasting from Alif to Yaa, takes place beginning at noon, 12:00 PM EST, and continues for about 45 minutes. Taught by Umm Mujaahid, Khadijah Bint Lacina, the class covers both religious and practical matters related to perfecting one’s worship during Ramadhaan. Taraaweeh prayers, supplications, beginning and breaking the fast, Zakaat Al-Fitr, safeguarding the limbs, heedlessness and controlling anger, having high aspirations, and much more. Based upon authentic knowledge from the Qur’aan and Sunnah with the explanation of the scholars. The second class begins 10 minutes after Fasting From Alif to Yaa ends. This interactive class, taught by Umm Usaamah Sukhailah Bint Khalil will cover a Surah a day from the Surahs of Juz Amma as well as Suratul-Fatiha. It will contain explanation of the Surahs, rules of Tajweed and evaluation of recitation, tips on memorization and review, the importance and benefits of learning and reciting the Qur’aan, especially within the month of Ramadhaan, and much more. All Muslim women who are eager to get the most out of their Ramadhaan! This is the Wiziq page for the course. This course seems to be based on a book they wrote, which can be purchased online. Note: Please refer all questions about the course to the sisters who are teaching the course, and not me. Please pass on the word so that other sisters can benefit, insha-Allah.